grandma's cookie jar: Tired, but Oh, So, Blessed! then just Josiah and Caleb slept over last night. With Thanksgiving and time with three and then two sweet boys, it has been a busy few days; but days which have left me feeling so very blessed! First of all, on Thanksgiving I was able to enjoy a tasty meal with my husband, children, daughter-in-law, grandsons and parents; I know so many people across the country are not able to spend special times with family and so I am extremely thankful I am and count them as some of my dearest blessings! Secondly, while two and three boys with no shortage of energy leave me tired, it is worth every second of being tired! Again, I know many grandparents do not get to have sleepovers with their grandchildren, so I sincerely appreciate being able to do so. We played games, made cookies, watched movies and just enjoyed laughing and being together! Josiah (age 6), Caleb (age 3) and Shane (age 1) are such sweet rascals - they acted like they were going to kiss me, but raspberried me instead! I told them they were rascals, which apparently they liked because later Caleb raspberried me again and asked me if he was a rascal again! 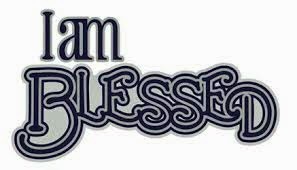 I am so very blessed! Finally, I know the One Who gave me all these many blessings; and He loves me! I am so thankful . . . and He loves you, too! I hope as you reflect on your Thanksgiving, you are blessed as I am!